Nearly all of my bike commutes make use of the Mount Vernon Trail. Unfortunately after significant snowfalls the lack of plowing by the National Park Service turns the trail into a linear glacier. I don’t like falling down (which I did last year) so I decided to take the alternate route, inland. For the first mile and a half the ride is the same. Instead of crossing Fort Hunt Road to make my way to the trail, I stayed on Fort Hunt Road. This road like all crappy roads in Virginia often has no shoulder. It is also a main route to US 1 and the Beltway. It gets a steady stream of motor vehicle traffic. The four-ish mile ride to the Beltway was uneventful. At the Beltway I took the connector trail to Washington Street. I had to walk ten feet because of snow and ice. Not too bad. At Washington I took a left to stay on the sidewalk. Once across the Beltway I made a series of lefts and rights until I was on West Street in Old Town. I was probably 13 blocks west of my normal route. I continued on West to Braddock. A left on Braddock led to the Potomac Yard Trail. This trail was surprisingly crowded with people walking dogs, walking to the subway, riding bikes and such. It also has no traffic lights and is flat for two miles. Bike commute heaven. The trail isn’t finished yet so I jogged over to Potomac Avenue, a new and mostly undiscovered road that runs between US 1 and the GW Parkway. This took me to Crystal City. I took Crystal Drive and its bike lane straight through managing to make nearly every traffic light. At the north end of Crystal City I picked up Long Bridge Drive. Flat and smooth. Long Bridge leads to Boundary Channel Drive. Bumpy and rough. Boundary Channel took my past a breathtaking Pentagon parking lot. It’s not a scenic route but there was no ice to deal with so you take your victories where you can find them. Boundary Channel led to Jefferson Davis Highway, a high speed divided road with a rare paved shoulder. About a quarter mile later I was on Memorial Drive and that led to a trail that runs along the edge of Arlington Memorial Cemetery. The graves still had the wreaths that were place on each one by volunteers in December. The trail took me to North Marshall Drive which goes up and down and up. At the entrance to Fort Myer, I banged a right and headed down North Meade Street which splits and becomes North Lynn Street. My bike allowed me to roll right past all the cars waiting at a traffic light. I arrived at work only a couple of minutes late. My odometer said that the trip was actually about a quarter of a mile shorter than my usual ride along the Potomac River. The ride home involved some improvising. I headed uphill from my office and turned left on North Moore Street. This took me back to the cemetery and Memorial Drive. I could have taken Jefferson Davis Highway but I would have been riding against the traffic. I didn’t feel like dying so I took Memorial Drive to the Mount Vernon Trail which was clear. After less than 100 yards I took a right and rode up Washington Boulevard on the sidewalk. This took me back to the Pentagon parking lot. From there I simply rode my morning commute in reverse. The only difference was that it was dark and intensely foggy. I put my headlight on low to keep from being blinded. The ride back home was again uneventful. So my first inland bike commute was success. Tomorrow I’ll probably do this route again. After that the Mount Vernon Trail should be clear. A few minutes ago I signed up for DC Bike Ride. It’s a 17 mile ride on closed streets. It was once called Bike DC. It’s not intended to be a serious ride, more like a meander. I meander like a boss. 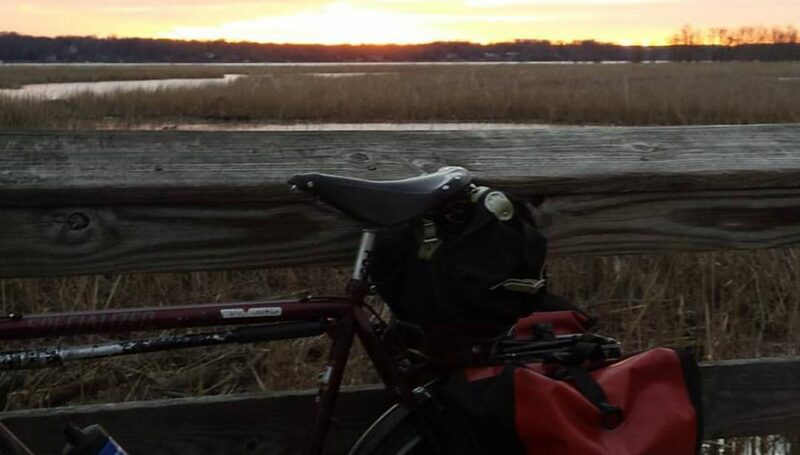 Posted on February 1, 2016 by rootchopperPosted in "Mount Vernon Trail", #bikedc, #bikeva, bike commuteTagged "Mount Vernon Trail", #bikedc, #bikeva, bike commute.